Compared to the rest of the world, Dubai is the tallest, largest, boldest, and fastest city in every possible sense. Its economy and tourism have grown at extraordinary speed. In less than five decades, it has gone from being an obscure city heavily reliant on oil revenue, to become one of most popular tourist destinations. Over the recent years, Dubai has emerged as a global city and attracted worldwide attention for its innovative construction projects. From creating man-made islands to unbelievable skyscrapers, the city has gained recognition as one of the most visited and fastest growing cities in the world. If you are only in Dubai on a stopover and can’t leave the airport, do not fret. No one enjoys spending an excess amount of time in an airport; but if that were to happen, Dubai International Airport (DXB) ranks high as one of the best airports for layovers. As the world’s busiest airport in terms of international passenger traffic, the airport offers lots to do that will easily help to kill those extra hours in between your flights. Traveling can be a stressful ordeal for most people. Sometimes, all you need is some quiet from the world. Head to Zen Gardens, located near Gate B7 and B27 in Terminal 3, for a tranquil experience. Lined with luscious green trees and fish ponds, enjoy this peaceful indoor garden oasis in the midst of a busy airport. Take deep breaths and calm your nerves. Complete with a new children’s area, toys, and children’s multimedia programming, the gardens are also great for kids. Provide them with an outlet to expend all their excess energy at the interactive games zone. This way, you can properly relax without your kids complaining about the layover or whining about being tired. If you are someone who struggles to sleep on the plane, this one’s for you. Sleep in the comfort of a bed without having to suffer in cramp and stuffy airplanes. DXB has several GoSleep Sleeping Pods in Marhaba Lounge and Snooze Cube. Nothing more than simple enclosed sleeping beds, the GoSleep Sleeping Pods are great for a quick nap. But if you have a long layover and are looking for a more fulfilling experience, the Snooze Cube offers a touchscreen TV, Wi-Fi, music, and space to store your carry-on luggage, within a bedroom-style cube. Choose according to your preference. Charged by the hour, these sleeping pods may just be your idea of heaven on earth. Fall into your own dream world within their soundproof walls and let your mind slowly slip away from the chaos of the airport. It is slightly pricey, but everyone could use a comfortable bed after a long flight. Located in Terminal 1 (Concourse C) and Terminal 3 (Concourse B) are Dubai International Hotel’s Health Clubs. Go for a run at the gym, a swim at the pool, or a dip in the jacuzzi. After sitting on a plane for hours, moving your body and stretching out your muscles may just be what you need. Freshen up at the centers’ shower stalls after your work out before you head to the plane. The Health Clubs charge on an hourly basis, so stay as long or as short as you desire. If your layover is overnight, head up to the five-star hotel for a comfortable rest in their luxurious suites. Known as “the shopping capital of the Middle East”, Dubai is heavily reliant on its shopping tourism market. Just because you can’t leave the airport, doesn’t mean that you have to miss out on the biggest tourist activity (i.e. shopping). Covering over 26,000 square meters (280,000 square feet) of retail space, the countless duty-free stores within the airport sell anything and everything. Clothes, perfume, electronics, candy — you name it, they have it. Walk around and observe the latest trends, or newest items on the market. Even if you don’t end up buying anything, walking around the shops is an easy way to pass time. Dubai International Airport has an abundance of dining options, from fast food to cafes to restaurants, that you can choose from. It doesn’t matter what time of the day your layover is — all food and beverage stores in DXB are open 24 hours. Get something to eat as you wait for your next flight. Or if you are not that hungry, just grab a snack before your flight. Tip: If you are flying Emirates and have a layover that is over 4 hours, you are eligible for a free meal voucher that is valid at several restaurants in the airport. Just head to Transfer Desk H2 to receive your voucher. Standing at 830 meters (2723 feet) tall and holding over 160 floors, the Burj Khalifa is the tallest structure in the world. When it was completed in 2010, the news of this towering structure was groundbreaking. The Burj Khalifa is, no doubt, the most distinctive feature of the city’s skyline. Be in awe of the surreal views of the city at one of its two outdoor observation decks, which are located on Floor 124 (“At The Top”) and Floor 148 (“SKY Level”). You will not only see the city, but the entire world from a whole new perspective. Going up to the top has become a highlight of Dubai, and is a must-do for any tourist. Tip: Purchase your ticket online before your trip to skip the lines. With only 1 day in the city, you would not want to waste time waiting to go up. Right in front of the Burj Khalifa is The Dubai Fountain, the largest fountain in the world. At any given moment, it sprays a shocking 22,000 gallons (83,000 liters) of water up to 152 meters (500 feet) into the air. If that alone does not make your jaw drop, the light performances will. At specific times in the afternoon and evening, the fountain is animated with a mesmerizing light and music performance. As if it were dancing, the fountain turns into a beautiful array of colors that you will not want to peel your eyes away from. As if having the world’s tallest building and largest fountain isn’t enough, Dubai is also home to the largest mall in the world — The Dubai Mall. Walk through the mall and the more than 1200 shops inside it. As a famous shopping destination, the building alone has attracted more tourists than some of the world’s major cities (e.g. New York City, Los Angeles). Can you imagine how unbelievable a building must be to attract more visitors than an entire city?! Within the mall, there is also a hotel, aquarium and underwater zoo, ice rink, SEGA Republic (indoor theme park), KidZania (children’s educational playscape), and movie theater. The mall is so big (it’s equivalent to over 500 football fields!) that if you had an entire week in Dubai, you could easily spend 3 days solely within the complex and still not have seen everything. Exploring a desert is not something you can do anywhere in the world. Join an evening desert safari that takes you on an adventure in the desert. The tour package includes a variety of local desert activities, such as a dune drive, camel ride, belly dancing performance, henna painting service, local food (desert BBQ, Arabic coffee) and more. It is a once-in-a-lifetime opportunity that you wouldn’t want to miss out on. With this tour, you will be able to check off multiple things on your bucket list in just one evening. Running from late afternoon till night fall, the evening desert safari is the best way to get a full desert experience. But if you are extremely pressed on time, morning desert safaris that only take 3 hours (instead of 6) are also offered, great for a short visit. Address: Rikks Cruises LLC / North Tours LLC , ISO 9001:2000 Certified Companies, Office No. 3206, Churchill Towers, Business Bay, Dubai U.A.E.. If you can spare another day to explore this amazing city, that is great news. There are so many things to do in Dubai that you could not possibly have seen everything in one day. After seeing the sights from Day 1, continue to discover the great wonders of the city on your second day. The Burj Khalifa may have given you a view of Dubai at 555 meters (1821 feet) above ground. But if that wasn’t enough, join a helicopter tour or hot air balloon ride for an unreal sight. Soaring high in the sky, you will get the complete picture of Dubai. To see the city, join a premier helicopter tour at helidubai. They offer 3 tour packages (Heritage, Explorer, Night Lights) that take you over the city with amazing aerial views of skyscrapers, and of the Palm Islands and The World Islands — two of Dubai’s most unique features. To see the other side of Dubai (i.e. the desert), ride in a hot air balloon for Balloon Adventures Emirates. Admire the golden rays of sunrise peeking out from the horizon. You won’t believe your eyes as the sky and the desert turn into incredible shades of fiery orange that looks as though it came straight out of a movie. Built as part of a project to create a series of islands (i.e. 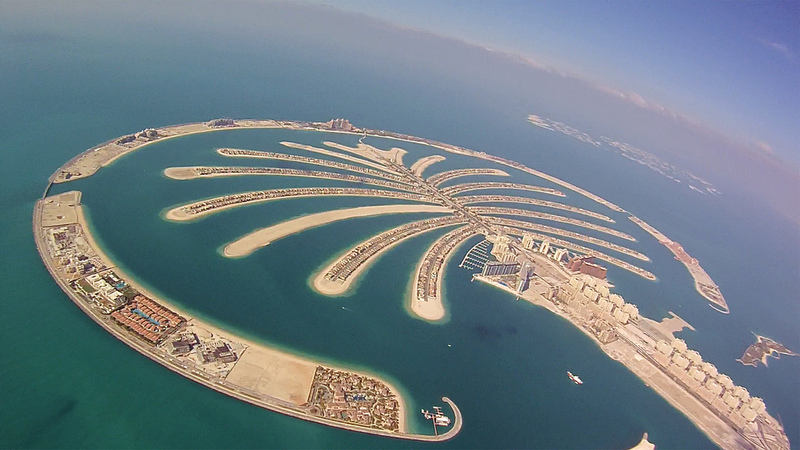 Palm Islands), Palm Jumeirah was completed in 2014 as the world’s largest man-made island. Even though the other islands are still under construction, Palm Jumeirah has become one of Dubai’s many signature landmarks. From an aerial view, it consists of a tree trunk, a crown with 16 fronds, and a surrounding crescent island. Located on the island are numerous hotels, resorts, and residences, including the famous Atlantis the Palm hotel. While you are on the island, don’t forget to visit Aquaventure Waterpark (see #3 below) or The Lost Chambers Aquarium. If you are interest, an exciting 2-hour speedboat cruise that jets around Palm Jumeirah is also available from Dubai Marina. While you are out on Palm Jumeirah, stop by Aquaventure Waterpark and spend a couple of hours there. Featuring some of the most thrilling and record-breaking rides in the world, Aquaventure Waterpark is only for the bravest. It has constantly been voted the #1 water park in the Middle East and Europe. One ride that you have to take is the famous ‘The Leap Of Faith’ water slide. Feel your heart drop as the slide hurtles you almost vertically down 9 stories in a split second and through a clear acrylic tube surrounded by sharks and cownose rays. You will not only get one of the biggest adrenalin rushes of your life, but also encounter some of the most interesting sea creatures. Tip: Get there early to avoid long lines, especially if you are visiting during peak season (November to March). Even though Dubai is home to many beaches, some are owned by hotels and are only available to hotel guests. Just because you are not staying in a hotel with a private beach, that does not mean you shouldn’t enjoy the sun, the sea, and the sand. Head out to a public beach and bask in the sunlight. Breathe in the smell of the ocean, feel the soft white sand run through your toes. Two recommended public beaches are Al Mamzar Beach or Jumeirah Beach. Complete with a swimming pool, playground, water sports, barbecues, grassy areas, and cabanas, Al Mamzar Beach is an ideal spot to lounge around for several hours. Food options are minimal; bring your own food for a little picnic by the beach. Also, do note that the beach is only open for women and children on Mondays and Wednesdays. Overlooking the Arabian Gulf is Jumeirah Beach. It is home to some of the best views of Burj Al Arab (see #5) and of the stunning Dubai sunset. Spend a couple of hours there in the evening to catch both the daylight and the sunset. Although it is not the tallest hotel in Dubai or the world (it is the 3rd tallest! ), Burj Al Arab has won the reputation as a symbol of modern Dubai. Located on a man-made island by Jumeirah Beach, the hotel itself is small, only accommodating 202 bedroom suites. With its Western- and Eastern-influenced décor, Burj Al Arab has consistently been voted “the world’s most luxurious hotel”. The only way to get into the hotel without staying there is to dine at one of the hotel’s 9 high-end restaurants, such as Al Muntaha or Al Mahara. But what makes this hotel worth a visit is not its interior, but rather its impressive exterior. Designed in the shape of a sail, Burj Al Arab pays tribute to the country’s seafaring heritage. From Jumeirah Beach, admire the blend between modernity and history that Burj Al Arab captures solely with its exterior. The best part is that you won’t even have to spend a single cent. A trip to Dubai would not be complete without a sample of local food. And a Dubai food adventure would not be fulfilling without trying a range of food, from the understated street stalls to the five-star restaurants. If you only have one day there, be sure to get the full experience with one affordable meal and one fancy meal. Go back to Dubai’s roots before it became a global city. Taste some local Middle Eastern cuisine at the city’s famous cheap-eats street, Al Dhiyafah Road. Meanwhile, on the other end of the spectrum, experience the luxurious side of Dubai at one of the many high-end restaurants by renowned celebrity chefs, such as Gordon Ramsay. Only after trying both extremes can you say that you have explored the Dubai food scene to its entirety. Experience traditional Dubai at Bastakia Quarter, one of its most picturesque heritage sites. Despite its present-day modernity and magnificence, Dubai was not always that way. Dating back to the late 19th century, Bastakia Quarter was built by Persian merchants who were drawn to the city by its minimal trade tariffs. Located between the Dubai Creek and the Bur Dubai district, it is a maze of wind-towered buildings. Take a stroll through Bastakia Quarter, and marvel at the contrast between Dubai then and now. It is pretty amazing to see how much the city has changed in a few decades. While Dubai has transformed into the definition of a modern city, it is important to remember its past as well. Now that you have seen most of contemporary Dubai, learn about Emirati culture and religion. Do so by joining a 75-minute long organized tour provided by Jumeirah Mosque six days a week for all visitors. Even though Dubai is a primarily Islamic city with many mosques, Jumeirah Mosque is the only one that allows non-Muslims to enter. At any given time, this beautiful mosque can hold up to 1200 worshippers. Made with white stone, boasting twin minarets, and a large central dome, it is said to be the most-photographed mosque in Dubai. Tip: The mosque is a religious place of worship, so remember to dress appropriately for the tour. Neither men nor women should expose too much skin. Nicknamed “the city of gold”, Dubai is the place to buy gold. Instead of the typical kitschy souvenirs (e.g. statue of the Burj Khalifa), buy gold as memorabilia of your trip. Don’t pass up your chance to get high-quality but affordable gold, and visit the Gold Souk. With over 300 stores, the Gold Souk is a traditional market that primarily trades gold jewelry. It offers a selection of brands, designs, and price ranges, catering to any budget. Tip: Only buy gold from the established stores, where the quality is closely monitored by the government. Street vendors are not obligated to follow the same regulations and often try to pass off fakes as the real deal. Also, be prepared to haggle. Some stores will name a higher price for tourists, and it is up to you to get the best bargain possible. With an average temperature of 25°C (77°F) during winter, Dubai seems like an impossible destination for any kind of winter activity. Yet, as with everything else in Dubai, nothing is impossible. Imagine you are skiing down the Swiss Alps at Ski Dubai, Middle East’s first indoor ski center. Located in the Mall of Emirates, it features an 85-meter (279 feet) high mountain with 5 slopes of varying steepness and difficulty, and a Snow Park play area for little kids — a place for both adults and children to have fun. If you have never seen snow, now’s your chance. The realistic winter atmosphere is maintained at a constant temperature of minus 1°C (minus 30°F). It is the perfect place to escape the intense heat outside of Ski Dubai’s walls. Serving as a center for sailing, shopping, and dining, the Dubai Marina Yacht Club is the ideal hub to spend your last evening in Dubai. Get amazing views of Dubai’s skyline from any of its 4 marinas. If you happen to be there in the evening, be sure to catch peaceful views of the sunset from West Bay Marina. Watch the sun slowly sink down into the horizon as night fall comes. Or get dinner along the coastline at Aquara Restaurant & Lounge. Nothing beats spending your last night to admire the city’s beautiful lights for the last time. Full of magnificent sights, Dubai should be on everyone’s list of places to visit. If any city in the world has proved that anything is possible, it would be Dubai. Yet, it is more than a luxurious shopping haven and an architectural dream. Even in the midst of its newfound sophistication, Dubai has managed to preserve aspects of cultural heritage that should not be forgotten. Anything shorter than 3 days in Dubai may prove to be a stressful trip to see as much as you can. But just as the city’s growth demonstrates, nothing is impossible and you can get a taste of the city with as little as a mere few hours in Dubai International Airport.